Imagine boarding a tram in Manhattan, which then leaves the city to connect with a high-speed train. You leave the tram for the train, and next thing you know you're in downtown San Francisco...all without ever stopping at a station. That's the basic idea behind Moving Platforms, which wants to take high-speed trains and remove the part where they stop at stations. Instead, the trains would simply slow down as they passed by cities, and a tram would rendezvous alongside it and extend walkways so that passengers could move from one to the other. The tram would then uncouple and return to the city while the train speeds back up again. You can see how it works in the video below. Believe it or not, people have been throwing this idea around since at least the 1960s, and this particular concept, known as Moving Platforms, is just the latest incarnation of this strangely persistent idea. While the idea of speeding up train travel is an appealing one — ask anyone who's ever spent an hour or two in a train stuck on the tracks — this isn't really an idea meant for our current infrastructure. This is more an idea for when there are high-speed trains crisscrossing the US and elsewhere. In this new model, trains would never actually enter a city. Instead, the trams would pick people up from various locations in the city, then go to rendezvous with the train. The trains themselves would apparently run continuously between their various destinations, stopping only for occasional maintenance. 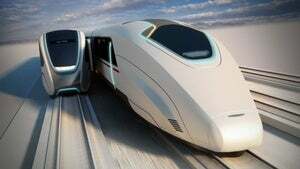 The beauty of this idea is that once you're on the high-speed train you can use this mechanism to transfer to other high-speed trains, allowing you to travel to other cities on other continents, anywhere in the world. The problem is we're trying to run a 21st century service on a 19th century infrastructure. I think stations are completely out of date, they've been around for hundreds of years. And with the modern technology, the modern trains that we're building now, having to have them stop at stations just seems ridiculous. It's a bold idea, and one that does rather pleasingly hark back to the flying cars and personal jetpacks of the 1950s. Navigating the logistics of this seems like a nightmare, though — even if you assume we can completely rebuild our rail infrastructure. What happens when a tram or train breaks down — which, judging by today's trains, is pretty much an inevitability — and they miss their connection? What if people can't move fast enough during the time the tram and train are connected? How would you deal with lots of luggage? These aren't impossible challenges, of course, but there's definitely a lot to do before this idea becomes even remotely practical, and Priestman himself acknowledges this is a big, lofty solution that isn't easily implemented. But hey, insane as this all is... yeah, I'd be first in line to ride one of these.